The Strength of TipTop: Data Analysis | TipTop Technologies, Inc.
← Looking to watch FIFA 2014? Let TipTop help! The TipTop Engine is a powerful data analytics machine that has the ability to not only read and interpret data, but also present such analysis to its users in an easy to understand, organized fashion. Today I would like to take the time to highlight three different aspects of TipTop’s analytics abilities, namely opinion/frequency analysis, segmentation and categorization. For each method of analysis, I have included a description and demo of the technology. TipTop’s main website (feeltiptop.com) is a highly advanced search engine that provides users with up-to-date news and trending topics. It takes data from multiple news sources and Twitter feeds, looks at which topics are most talked about and presents this data to the user. In the image below, the featured topics are contained in the “Topics in the News” section. Each of the words is color-coded indicating positive (green), negative (red) or neutral news (orange), which TipTop has determined through its extensive analysis of the news topic. Additionally, the size of the font indicates importance or frequency of the topic with larger text meaning higher frequency while smaller text meaning lower frequency. When a topic is clicked, TipTop generates a list of the articles relating to that topic and provides links to the user so they can read more about it. Another one of TipTop’s data analysis methods includes categorization. This is the ability of the engine to read data and then determine categories in which to divide the information contained in such data. TipTop has applied this form of analysis to it’s recently launched TV Widget, shown below. Here TipTop compiles different forms of data on televisions, whether it be reviews or other information sources, and then creates categories on which to compare the televisions. These categories are listed at the top of the bar and under this, TipTop has even given a score to the respective television for that category. Another very useful application of categorization is in college or university comparison. Students nowadays have a lot to consider beyond just reputation when they want to decide where to apply to college. 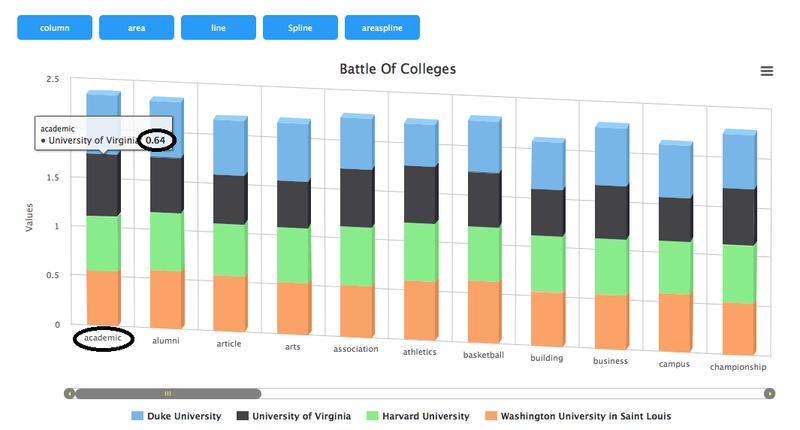 With TipTop’s Battle of Colleges, students can compare numerous colleges in numerous categories. In the demonstration below, four colleges are compared, and the data is displayed in a single bar chart. The categories for comparison are located on the horizontal axis while each score the school received in that category is on the vertical axis. You are able to see each individual score by dragging your mouse over the graph, as done below. TipTop also utilizes another visualization technique with categorization known as the Treemap, shown below. 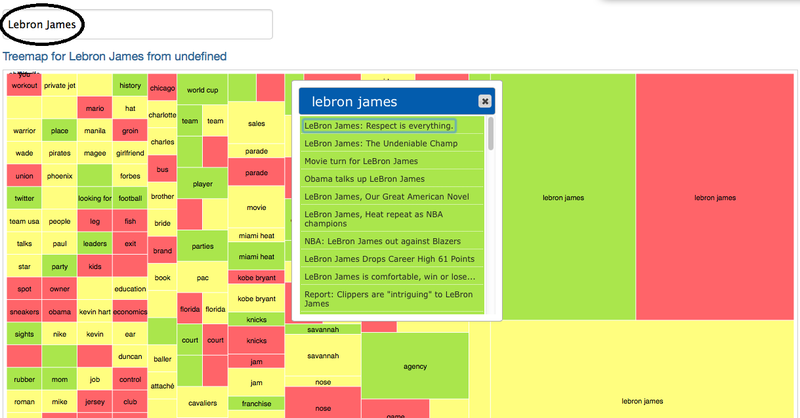 This interface was used to look at news topics around the world. 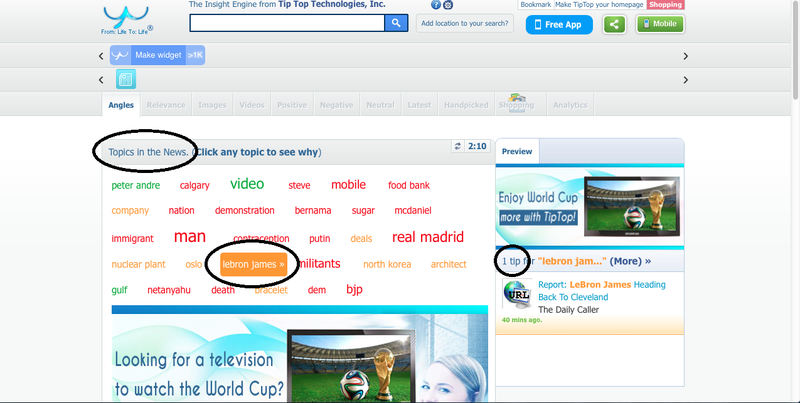 I decided to look up some more information about Lebron James. All I did was type his name into the search bar at the top right corner. The Treemap design is similar to that of feeltiptop, as in the color coding scheme is the same and rather than enlarged text, the larger size of the box indicates more articles. By clicking on the box, a pop-up window appears with links to different articles about the topic you have searched for. The final form of analysis I would like to look at is that of segmentation. This is essentially the ability of TipTop to take a piece of user-inputted text and segment it or split into it’s various parts. 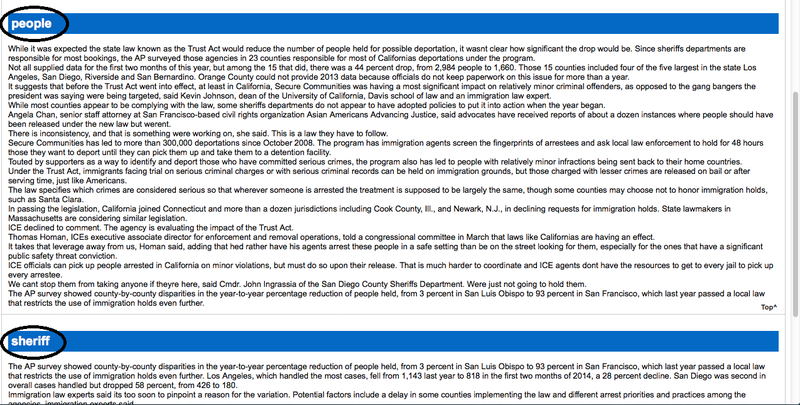 Below is a demo of the technology used on an online article about the recently passed California TRUST Act. As shown below, TipTop has split the article into its various parts based on what the article discusses. Under each category is the actual text of the article which helps the user determine where to look in the text for specific information. TipTop’s multiple forms of analysis and visualization truly exemplify its unique and broad versatility. We at TipTop are harnessing these abilities and working on new opportunities for the technology as well with other companies to bring our technology to them. Be on the lookout for more news about TipTop! Rahul Raj, Marketing Intern at TipTop Technologies, Inc.